As the complexity of building websites has snowballed over the past two decades, the demand for front-end developers and designers with a wide range of skills has grown considerably. Recruiting those developers and designers has long since become an exercise in unrealistic expectations. It’s practically a requirement for front-end developers to have “expertise” in JS, CSS, and HTML, while designers are now often required to prototype their own designs. There are obvious benefits to designers or engineers learning skills outside their comfort zones, but when was the last time you saw a job for a dedicated HTML/CSS engineer? Many web development companies tend to think of HTML/CSS as an afterthought—often lumping it together with other design or engineering roles. If UX isn’t a high priority, that approach might work fine. However, the dedicated HTML/CSS role is DockYard’s secret weapon—the keystone of our development process—allowing Design and Engineering teams to bridge together in ways others can’t. Conversely, the industry has continued to gravitate towards a dilution-based approach to employee skills. The extreme example of this is the full stack developer. We might compare them to daring solo pilots who take on the impossible missions. Sure, the skilled solo pilot can cross an ocean, or even conquer the Death Star when the odds are against them. You might hire them to do the Kessel Run, but you’ll likely be in for a bumpy ride. 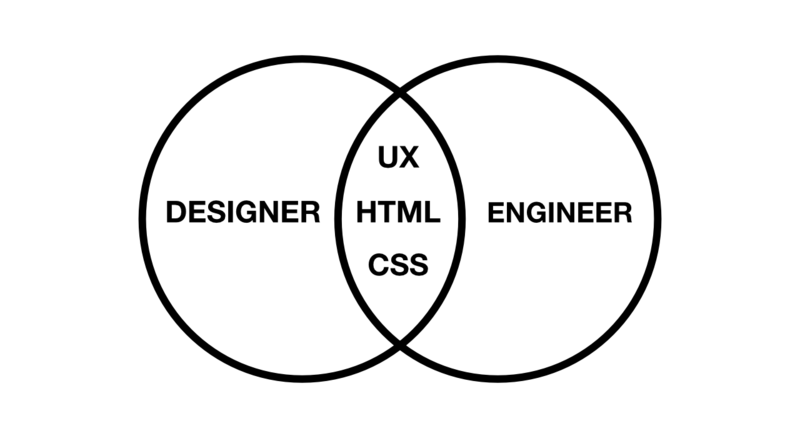 For most web teams, this means recruiters are often looking for a wide range of skills between designers and engineers. This is how a lot of web teams are expected to work. Given the sheer complexity and breadth of each discipline, can anyone really have expertise in JS, HTML, and CSS? The art and craft of laying out the actual website becomes something that can get lost in the middle. That try-to-master-everything approach may work fine for some companies, but in practice, those teams end up being a little rough around the edges. These kinds of do-everything teams are the industry norm. And while they are arguably capable of getting the job done, their lack of expertise inevitably leads them to take shortcuts and rack up technical debt. It’s all fun and entertaining, of course. But the reality is that most teams neglect UX precision and, perhaps most unfortunately, don’t have the resources or mastery to ensure their projects are accessible to people with disabilities. Having separate roles for the engineer and helmsman is an ideal crew for navigating an Enterprise-class starship. The same is true for professional web teams. When you have individuals whose sole responsibility is to focus on HTML/CSS, your UX can exist as a reliable Enterprise framework that smoothly scales to millions of page views, while supporting dozens of different locales and devices. Secondly, the dedicated UXD role makes our engineers and designers even better at their jobs. Our engineers don’t need to juggle the ins and outs of UX, responsive layout, sub-pixel rendering, typography, color theory, composition, user modeling, or accessibility. Instead, DockYard engineers can focus on being world-class Ember.js developers. That’s what they love to do. Likewise, our designers don’t have to deal with the idiosyncrasies of HTML, CSS, structured data, compilers like PostCSS and Sass, or browser inconsistencies. They don’t have to know why some browsers antialias their glyphs differently or which SVG attributes are needed when optimizing vector files. And by freeing up their minds to not have to deal with the things that are largely irrelevant to their talents, the designers can focus on what they do best: designing. When clients see our team functioning like the crew of an Enterprise-class starship, they understand what it means to have Enterprise UXD. Enterprise UXD isn’t only about having meticulous stylesheets and highly structured, semantic, HTML. It’s about having designers and engineers who get to focus on what they do best. Our engineers get to be engineers, our designers get to be designers, and our UX Developers get to be UX developers. This means we have a culture where our employees can enjoy the satisfaction of mastering their skill set while having a client that can trust the expertise and intellectual autonomy of each DockYard team member. Additionally, everyone on the team is able to learn, teach and expand each others’ skills. We all get to learn from the best. The end result is a highly organized professional culture that thrives on each other’s strengths and weakness. This is why we feel the dedicated UXD role is DockYard’s secret weapon that sets us apart from other agencies. In a previous blog post, Scott Newcomer, an engineer at DockYard, explored the unique benefits of working with the dedicated UXD team and demonstrated how that dynamic results in such positive results. Would you make a good fit on the DockYard UXD team? Let us know.